Freedom to roam is what kids love best about the Ranch. They can fish the pond for trout, play Ping-Pong, hike up Knob Hill behind the lodge, saddle up on Bascoe and take a trail ride. Kids often enjoy getting a Junior Ranger Badge, feeding the fish at the hatchery down the road, manning a paddle boat or kayak at Redfish Lake, and stopping in to Smiley’s for one of America’s best milkshakes. Other popular children’s activities include: paddling around the pond in our paddle boat; pony rides for young children or part or full-day trail rides; mellow hikes to lakes or along streams; swimming and soaking in our natural hot springs pool — no chills here; exploring nearby Custer and Bonanza ghost towns, deserted after the Gold Miners left the area in the early 1900s; learning about the plight of the Salmon at the Sawtooth Fish Hatchery (and if lucky seeing fish jumping up the locks on their return from the Pacific); visiting the Stanley Museum, and stopping for an ice cream at River 1 or Peaks and Perks; whitewater rafting the Salmon River; rock climbing the “slabs” with Sawtooth Mountain Guides; swimming, canoeing, kayaking and playing on the beach at nearby Redfish Lake. 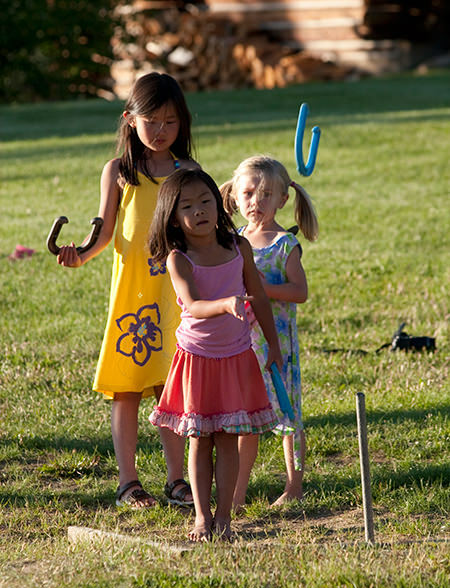 On-Ranch, kids can mine our toy box and find balls, frisbees, a croquet set and other games to be enjoyed on the front lawn. The lobby shelves are stocked with games, puzzles, and books for rainy day or more restful activities. And the chess and checker table always is ready for a competitive match! Three nights a week — Sunday, Wednesday, and Friday — staff organizes front lawn games, crafts, and story hour from 6-9pm. Children can eat early on these nights, allowing their parents some alone time in the lodge dining room. Off-duty staff members often are available for childcare. If you would like to plan an adults only activity during your stay, just ask and we can facilitate these arrangements. © 2017 Idaho Rocky Mountain Ranch. All rights reserved.